Last summer, one of our student’s mothers contacted us with a rather exceptional request: follow and tutor a group of twenty or so students on their downhill ski competition in Austria and western Canada. We moved heaven and earth to find a tutor that could take advantage of this great opportunity. Francis, math and science tutor, summarizes this experience for us. 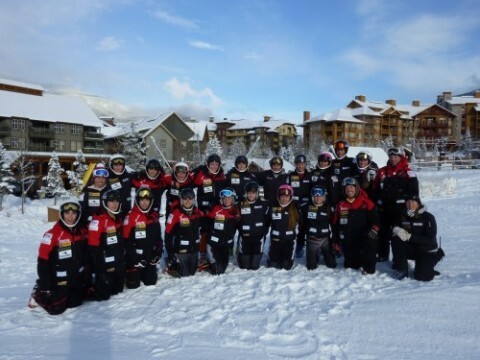 In fall 2012, the Eastern Township’s elite downhill ski team was leaving to train in the most beautiful mountain chain in the world. The first three weeks took place at the Hintertux glacier in Austria. The last two were at the Panorama station, in British-Colombia. Every morning, the students would leave early to get on the mountain, they would have lunch up top and would come back at around 3:00 or 4:00pm. Intense training! They are real athletes. I had the unforgettable opportunity to accompany them for the duration of the training camp. It was a memorable time! I had to cancel two university sessions in order to be able to leave for so long: I do not regret my decision. Every night before supper, the students would set up around the table to do their homework. My job was to motivate them, structure their homework sessions, and especially to answer their question in order for them to move forward as efficiently as possible. I had three secondary three students, three secondary four students and eight in secondary five. Gradually, I gained a place in this big family where everybody is always talking about turning techniques, anecdotes about tourists falling off the T-bar, the best skiers in the world, the fog at the summit, the bruises on their arms, etc. A really great gang! I was a sort of hybrid between a trainer and a student. Pretty great! Authority? I had neither the need nor the intention of putting myself in a position of authority over them. On a few rare occasions, I had to intervene to make the study environment less noisy. The ambiance was always pleasant. Questions? I was asked a ton! And good questions too. They made me work hard. Every day, they left with a slightly less foggy understanding of science or math and they would thank me warmly. Motivation? That is the variable that changed a lot from one day to the next. Where do you find the motivation to study when physical exhaustion and the feeling of already having worked enough takes over you? It can come from two places, often simultaneously. First of all, the parents kept a watchful eye on their kids. They are their main sponsors and they intent on them doing really well. 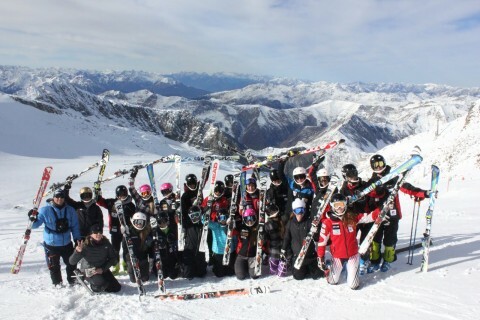 For the most part, if the grades at school were not satisfactory, skiing is over! Therefore, no choice to work hard to catch up the months missed at school because of races and training. They know they mustn’t get too far behind. Secondly, other than the build up of lactic acid, injuries and the desire for naps, the incredible health of these students keep them going. Cardiovascular health, but especially hormonal/mental health comes from their team spirit. What I mean by this is a spirit of competition, but also of rigor, respect, mutual help, and encouragement. The mountain of work seems never ending, but it’s as if a great big gondola carriers them up and brings them to open their books, earphones on their ears, and jump into it head first. Impressive. Page 118, #6 to 22 the laws of exponents, trigonometric circles, personal final International Education project, laboratory reports, Hess law, etc. The list is long, but fascinating! At least, that’s my opinion. Some nights were more difficult than others, especially when the chronometer disappointed them, but that’s life. One of my students, the one that was having the most trouble, told me that if it hadn’t been for skiing, he would have dropped out of school. But he will continue at school, I am sure of it, and he has the potential too. Are they living their dream? I think so! They know that life has spoiled them, and that they take it into account in their way of seeing the world. They still have a lot to learn beyond the ski hills, but they are well on their way. Skiing is their life. Some have been doing it since the age of two. This type of training trip is more and more familiar to them, but they aren’t about to take it for granted. One thing is sure, I was one of the most excited when the plane was taking off! I thank you 6,023 X 10^23 times for allowing me to live this experience. I will remember it my whole life.